At the height of the kitchen chaos, an old friend, now a priest, walked into the house. We hadn’t seen each other for six months, and he was eager to greet me with a big hug. I, however, gave him a gruff “Hey, what’s up?” barely making eye contact with him before I looked down to do battle with the array of pots and pans simmering on the range. His smile faded as he walked past me to see who else was in the living room. Later, I repented of my anxious self-concern. Like Martha in the Gospel, I had put a task over and above something more important: a human person standing before me. 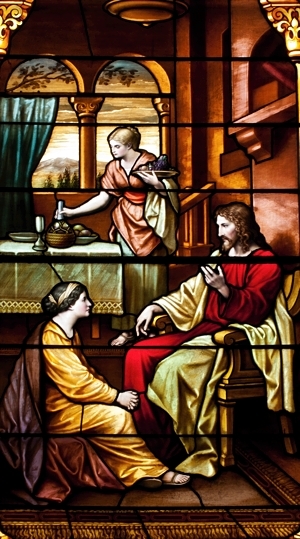 In the case of Martha, this person was the Son of God, Jesus Christ, and she even dared to tell him what he should be doing! It happens to all of us. We’re involved in so many activities — ones that are good, very good, and sometimes necessary. Yet, in our drive to complete our duties well, we can forget the one thing that is necessary (Luke 10:42). When is the last time you were successful at something, only to realize that you missed the whole point? For me, the one thing, the better part, was simply to greet my brother with the love of Christ. It would have only taken 20 seconds. But in my culinary frenzy I was afraid that, without absolute concentration, something would go wrong with dinner. And then what would people think of me? I think Martha felt something similar. We both worried about our looking good before our guests rather than receiving them in accord with their lofty value and dignity. Like every line of Scripture, the Lord speaks to us today to our situation. This Gospel episode warns us of the great danger of activism, a problem particularly acute in the digital era. When we give into activism we use people for the sake of fulfilling tasks, instead of vice versa. Even those who are involved in lots of “church stuff” are not immune from it. We might be at the parish three nights a week or more, but have we let ourselves sit at the feet of Jesus in prayer? We might call ourselves very “involved,” but is the Lord involved? Have we quieted, like Mary, our restless hearts in order to hear the words of the Word of Life? Where does Christ want to take away the anxiety and frustration of trying to do good and look good, in order to give us the peace of simply being with him, confident in our identity as beloved children of God? This is peace the world cannot give (John 14:27). In all your activities and tasks this summer, stay close to Jesus Christ, the one thing necessary — and the better part. Deacon Paveglio is in formation for the priesthood at the St. Paul Seminary for the Archdiocese of St. Paul and Minneapolis. His home parish is St. Stephen in Minneapolis, and his teaching parish is Our Lady of Peace in Minneapolis. In what situations or parts of your life do you need to quiet your restless heart in order to grow closer to Jesus?